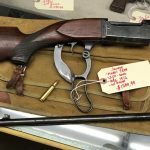 They’re bygone days now because you can buy a quality and accurate rifle like a Mossberg or Savage for a few hundred bucks, but it used to be that if you wanted a good rifle on the cheap, you would build one from a surplus Mauser. I was fortunate to catch the tail end of that era. Actions were plentiful and inexpensive, Brownell’s had any modification part you could think of, Fajen had semi-inletted stocks and Midway offered short-chambered barrels you could thread in at home and finish ream by hand using a rented chamber reamer. A lot of Mauser sporterizing stuff is still available from those sources, but actions are harder to come by and not so cheap. These days, sporterizing a Mauser isn’t so much about saving a few bucks, but instead about having a “guy” project to work on—though women can sporterize a Mauser equally well. “Robert’s Rifle” Scott originally built this rifle for his stepson, Robert. It has a Midway barrel appropriately chambered in .257 Roberts. It used to have a Fajen stock that was cut off in sections that could be added as Robert grew, but the gun has since been appropriated by a younger brother and the stock replaced with this one from Boyds. The cocking piece and safety are from Brownell’s and the bolt handle is forged down. 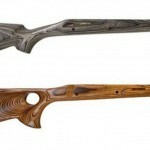 Using Hornady’s 117-grain load, this rifle has cleanly taken whitetail as far as 330 yards. The “Swede” When Scott gets out the Swede, things die. This Swedish Model 96 was his first sporterizing project. 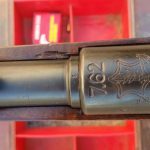 The barrel is original (though cut to 24 inches and crowned the old fashion way using valve grinding compound on a brass-headed screw powered by an electric hand drill) and the stock is a Fajen Aristocrat. The trigger is a Timney and the low-mount safety is from Brownell’s so he can use a scope and still have a safety. At the time he built it, Scott was dating a girl whose father was a blacksmith who forged down the bolt handle. It was a seriously botched job, so Scott later paid a real gunsmith to cut off and re-attach the bolt handle properly, and also drill and tap the receiver for the scope bases. Things with the girl didn’t work out, but the Swede is an incredibly accurate rifle and has taken countless deer. The “Scout” This is a great way to get a lot out of a Mauser without having to do a lot to it. This Mexican Mauser was given as-issued to Scott for helping a friend move. He turned off the 7x57mm-chambered barrel to a more reasonable length and crowned it in a lathe. The scope base is an XS Scout Mount topped with an Aimpoint. With that base, you use a low-powered pistol scope or red dot sight and keep both eyes open—it’s amazingly quick to get on target and the arrangement lets you keep the Mauser straight bolt handle and cocking piece-mounted safety lever. Here, even the trigger is the original two-stage military unit. Everything is set in a laminated stock that Midway once sold. With 154-grain Hornady roundnose bullets, the gun is a great whitetail and elk rifle at close to moderate ranges. 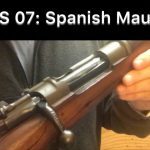 The “Mannlicher” One of Scott’s best friends had a Ruger M77 International with the full-length stock that he coveted, so he built this Mannlicher on a Spanish action chambered in .308 CETME. 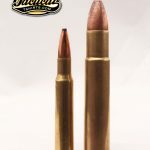 That cartridge is dimensionally identical to the .308 Win., but operates at lower pressure so Scott uses only mild cast bullet loads in this rifle. The barrel is the original military one, though shortened, and the bolt, trigger and safety are as-issued. The stock is a Fajen and sights are Williams. Parts such as the steel buttplate, steel forend cap and silver inlays came from various sources such as Brownell’s and Dixie Gunworks. The “Elephant Gun” Scott hasn’t taken an elephant with this gun and probably won’t because they’re too dangerous to fool with using a “homemade” gun, but when guests come into town they get a “blast” out of firing this .458 Win. Mag. The Midway barrel was left in the white and the action is topped with a 2x scope. Instead of turning down the bolt handle, Scott welded on a new Brownells’ bolt handle. The Bold trigger moves the safety to beside the Brownell’s bolt shroud so the safety can be used on the scoped gun. Everything is bedded in a cheap, off-brand synthetic stock with faux wood finish.